Powerful, twin-motor wet & dry vacuum with tilting stainless steel waste container. Featuring the Ap semi-automatic filter clean system for constantly high suction power. Express Shipping, stock product in 1-2 days. Call us now for more info about Karcher products. All prices showed in our website are VAT included. 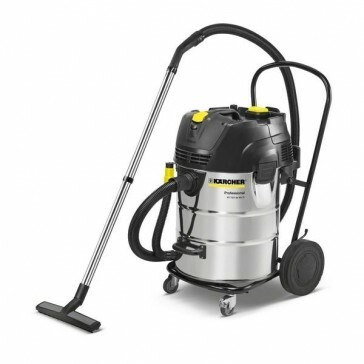 The NT 75/2 Ap Me Tc is a high-performance wet/dry vacuum cleaner with the ApClean system for constantly high cleaning power and uninterrupted use. The robust 75-litre tank is ideal for large dirt volumes and is easy to empty thanks to the tilting chassis. This vacuum cleaner has a compact turbine casing with integrated filter cover for easy removal of the large flat pleated filter. Effective semi-automatic ApClean filter cleaning provides constantly high cleaning power, uninterrupted use and long filter life. The NT 75/2 Ap Me Tc also features electronic fill level monitoring, ensuring the maximum allowable fill volume is not exceeded with wet vacuuming. Vacuumed liquids can be easily be emptied via an oil-resistant drain hose. Accessories can be attached to the vacuum cleaner quickly and easily using the practical clip system. The device has a hose storage compartment, an accessory compartment and a large storage area (e. g. for tools). With 75 litre stainless steel container and tilting chassis for easy emptying of dry dirt. Large on-board storage area for tool and accessory storage. The free filter means that the user can work for long intervals without interruption. Optimal suction power with high efficiency. Convenient suction hose and bend attachment for easy transport and storage. Delivery will be charged based on that chargeable by a national carrier or Royal Mail unless the goods are offered for sale inclusive of delivery charges. Please be aware that at the point of delivery a signature will be required. Please sign all items "UNCHECKED" unless you have checked and you are happy in its condition. You as the customer must inspect any goods before signing for them as satisfactory. Any damage found MUST be noted on the delivery note and delivery refused. For any reason you are still requiring more answer on information regarding your order, please do not hesitate to get in contact with us, as we will be more than happy to assist you with your queries.